It is unfair to any author to wander into a book expecting something and then being disappointed when it's not delivered but I'm human and I can't help it. Reading this book, I had hoped to read something like Barry Hughart's adventures with Master Li and Number Ten Ox (Bridge of Birds: A Novel of an Ancient China That Never Was et al.) or Robert van Gulik's Judge Dee stories (Judge Dee at Work: Eight Chinese Detective Stories et al. ), except in this case the celestial and infernal bureaucracies are real. Or a mystery along the lines of Colin Cotterill's Sari Paiboun novels, where a Laotian coroner is the reincarnated soul of a Hmong shaman. With Hughart and Cotterill there's a spritely, lyrical quality to their writing that makes you believe (or want to believe) that what you're reading could really happen; van Gulik delivers interesting, Holmesian whodunits solved by a character I find delightfully fascinating. Liz Williams manages to create moderately interesting characters but I didn't find the story terribly interesting or the execution distinctive enough to make the work stand out. The two chief characters are Chen Wei and Zhu Irzh. Chen's the human, and his dearest wish is to be just an average cop allowed to do his job with a minimum of interference from mundane or spiritual powers. Unfortunately, little in his life conduces to this aim: He has a near unique access a rapport with Heaven and Hell and he's married a fugitive demon (Inari) who hides out on his houseboat with her family's familiar - a spirit that alternates between posing as a tea kettle and ambling about as a badger). There's little explanation for Chen's uniqueness but I can put up with ignorance so long as it doesn't interfere with understanding the storyline. Besides, it's a series and presumably readers who continue to follow Chen and Zhu will have more revealed to them. Zhu Irzh holds a similar position as Chen in the hierarchy of Hell - a middle-level functionary who'd like to get his job done without crossing the paths of his superiors too often. In many ways, Zhu was a disappointment. As Williams portrays him, he's a typical, swashbuckling rogue in the tradition of D'Artagnan and Han Solo. Essentially a human with strange eyes and a pointed tail. It would have been more interesting and challenging if his character really had been demonic and he became Chen's "friend" (or at least "ally") because of the logic of that nature. Not because he's been "infected" with a conscience as is intimated at one point in the book. This is one of the strengths in C.J. Cherryh's Pride of Chanur series: Pyanfar manipulates the unique psychology of the kif to get them into the Compact and obeying its rules; they're not just humans with prosthetic foreheads a la "Star Trek." I could raise a similar objection to Inari, Chen's demonic wife. She's basically a human woman escaping an arranged marriage. Without giving away too much, the story revolves around Chen and Zhu uncovering an unsanctioned plot by the Ministry of Epidemics to unleash a plague against humanity using stolen human souls (many intended for Heaven). 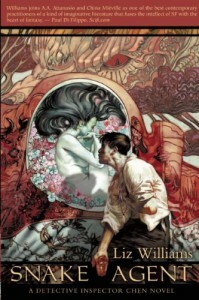 It's not a bad plot but not especially remarkable, and Williams invokes a couple of deae ex machina (Kuan Yin and the Goddess of Plagues) to bring everything to a happy conclusion, which I found unsatisfactory. I like Williams. It's been years since I read it, but I remember really enjoying Empire of Bones and saying to myself, "I'd like to see more of her stuff" but I don't think she's at her best in this book. I may pick up the further adventures of Inspector Chen if there's opportunity but they're "brain candy" - something to read when I need a break from "serious" novels or nonfiction.